The Soviet liqui­da­tion of the Ger­man Sixth Army and its Axis auxil­iaries prompted three days of national mourning and the clo­sure of all non­es­sen­tial busi­nesses in Ger­many. It also in­flicted lasting trau­ma on the Ger­man people. Long term, Stalin­grad was a turning point in World War II. 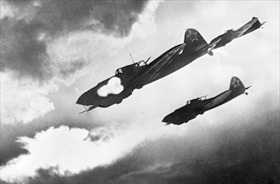 Hitler would reach no farther into the Soviet Union, and the Soviet Army acquired a new sense of its bur­geoning power. 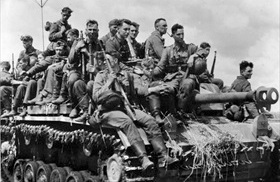 The boost to Soviet morale was immea­sur­able, giving the Red Army im­petus six months later to resist Ger­many’s armed forces at the Battle of Kursk (almost 50 Ger­man divi­sions con­taining 900,000 troops, 10,000 artil­lery pieces, 2,700 tanks, and 1,860 air­craft) in the most bru­tal armored battle in his­tory. For the third time in as many years, the mighty Ger­man Wehrmacht was stopped on the road to Mos­cow, the Soviet capital. 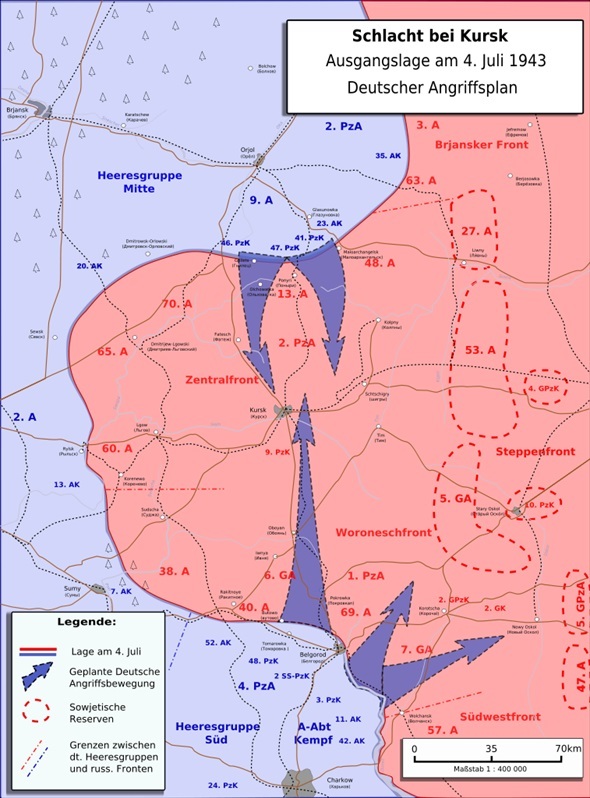 The un­suc­cess­ful Ger­man assault on the bulge in Soviet lines around the city of Kursk in July 1943 marked the deci­sive end of Ger­many’s offen­sive capa­bil­ity on the East­ern Front and cleared the way for the great Soviet offen­sives of 1944–1945, cul­mi­nating in the cap­ture of Ber­lin in May 1945. As for Paulus and his Sixth Army, some 91,000 sur­vivors at Stalin­grad began a forced march to POW camps in Siberia. Half died on the way, and nearly as many in the camps, where the men were desig­nated “war cri­mi­nals.” Only about 6,000, including Paulus, returned home. During his cap­tivity the former field marshal became a vocal critic of the Nazi regime and was a wit­ness for the pro­se­cution at the Nurem­berg Trials (1945–1946). Upon his re­pa­tri­ation in 1953 Paulus settled in the Soviet sector of Germany (German Democratic Republic), where he died at age 66. 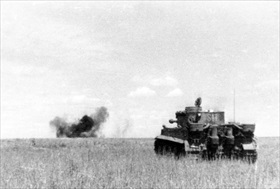 Right: A Waffen-SS Tiger I tank scores a direct hit on a Soviet T‑34 medium tank during the Battle of Kursk, July 10, 1943. The quality of the optics of the Tiger I and the high-velo­city 88mm gun it mounted allowed it to devas­tate tar­gets at long range with great accuracy. 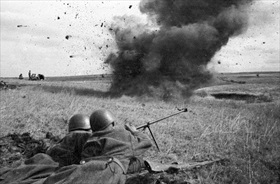 Right: Soviet antitank riflemen take aim at an enemy tank after the Battle of Kursk had wound down, July 20, 1943. 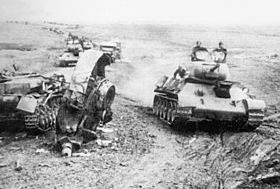 The Battle of Kursk was the first battle in which a Blitz­krieg offen­sive had been defeated before it could break through enemy defenses and into its strategic depths. 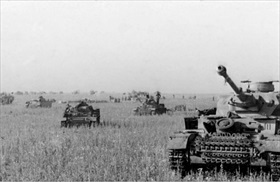 Kursk, it can be said, was the Soviets’ critical con­tri­bu­tion to winning the war against Hitler and his Third Reich.